Biology gives us a not-so-subtle hint: men ought not be the ones wearing tight-fitting pants. Wrap-around clothes are much more comfortable than even the best of pants, and I've had some nice pants made in my day. 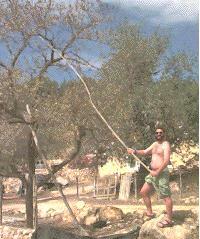 In the old days my experience with alternative clothing was limited to a towel wrapped around myself on a beach, or a long summer in the Mediterranean, harvesting almonds by beating a stick on the tree branches, sporting a very comfortable lunghi. Why should that sort of joy be limited to vacations? It shouldn't! Thanks to seeing other Black Rock City Rangers at Burning Man clad in a modern American variant of the classic elements of Scottish national dress, I'm a fan of the kilt. A long time ago, when I started this kilt weblet, I disclaimed any knowledge of traditional kilts. 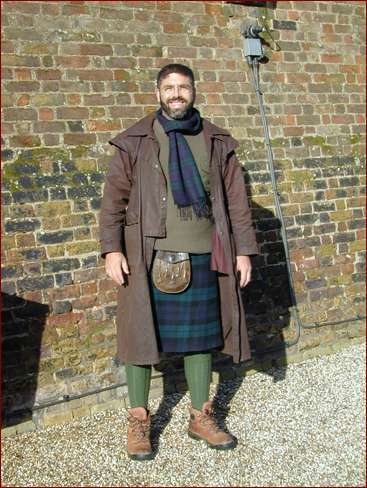 These days, in addition to my modern kilts I also have summer- and winter-weight traditional Scottish wool kilts. Generally I like them better than the moderns, but they're more expensive and require more care, and so the moderns (purchased with great thrift) have their place. Above you see me in cold, snowy London. Despite the sub-freezing temperatures and high winds along the Thames, I'm comfortable in a 1960s heavy-weight kilt.